"We've received the letterhead and envelope portion of our recent order and they are absolutely BRILLIANT! We've worked with a lot of printers in the past and nothing has compared to the customer service and quality of materials like what we've experienced with PFL." Even in our digital age, companies still rely on printed letterhead for professional communications. Contracts, client or fundraising letters, internal memos and other company documentation still make their best impression on commercially-printed letterhead, especially with matching envelopes. Overall design: How do you want to come across? Solid and steady, quirky and creative, or stylish and sophisticated? A simple design with your logo and contact info may be appropriate for the type of business you have, or you may need a stronger dose of graphics to create the right image. Letterhead Content: Baseline is your company name, address, phone numbers and email address. Also include your logo, company website and slogan, if you have them, on your personal or corporate letterhead. Be creative on where you put the info, you're not limited to the top of the page! Fonts: What fonts or typestyles best reflect your business? Fonts can be formal or fun, classy or cool - try a few and see what fits with your logo and your style. Or, use what you already have on your other marketing materials. Make sure the fonts you use are readable and not too small - generally stay between 9 pt. and 12 pt. Color: If your company logo is usually black and white, printing your letterhead in black ink only may suit your image just fine. Otherwise, use color to grab attention and reinforce your brand identity. Even the background can include some color, if it's light enough for the text of your letter to be read whether printed or handwritten. And don't forget companion printed envelopes to make a great impression! You'll generally want to keep your return address at the top left for postal use, but you can be just as creative as on the letterhead in look and feel with fonts and colors on your envelopes. 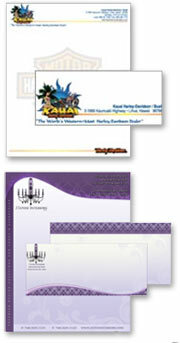 Designing and printing your letterhead and envelopes in tandem creates a unified brand image for best impact. Finish: Smooth or textured, you'll want a quality uncoated stock that you can run through your laser or desktop printer without smudging. Smooth stocks show off your color designs the best and are less expensive and more commonly available and cost effective, while textured stocks such as linen or laid offer a nice tactile, high-end feel. If you want to match your letterhead more closely to your business cards or brochures printed on glossy or dull/matte coated stocks, go for smooth stock. Weight: Don't settle for less than premium-weight paper for your letterhead and envelopes - the standard bond paper most offices use for copying and printing won't give you the sense of quality you want to convey in your official letters. Look for 70 lb text or 24 lb bond. You can feel the difference! Color: While plenty of options are out there for colored paper, you can get the same effect by using a colored background in your design that's printed on often less-expensive white paper. Be aware that ink prints differently on colored paper than on white, so determine what you're trying to achieve before deciding on a colored stock for your letterhead. Sustainability: You don't have to sacrifice quality for environmental responsibility. Choose environmentally responsible papers, or ask about fine writing papers that include recycled content. Work with your designer or favorite graphic design software to put your ideas in motion and create unique letterhead printing that beautifully shows off your business for just pennies a piece. Need help with your next letterhead project?